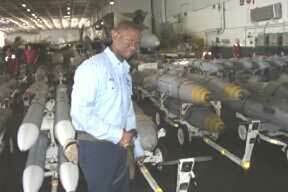 Benson Sharpe and some of the ordnance used during the OIF conflict. Benson Sharpe, a Boston Crusaders' alum (he marched in 1999 and 2000) from Miami, just came home from a 10-month deployment on the aircraft carrier USS Abraham Lincoln, as part of Operation Iraqi Freedom. "I want to say though that if I had not had the drum corps experience I had the past three years would have been the most difficult years of my life," Sharpe said. Sharpe entered the Navy right after the 2000 season.